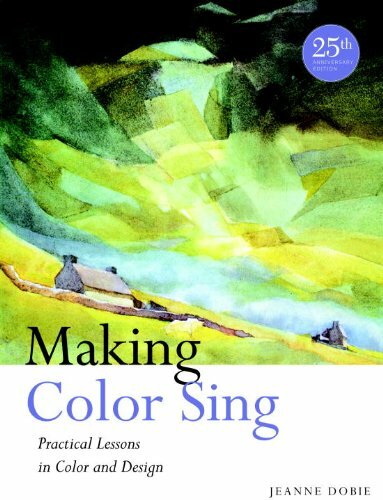 Making Color Sing is one of the better books that talks about colours. The main medium used in the book is watercolour, although it's strangely not mentioned in the title or the book description. The 31 lessons in the book are quite comprehensive with practical tips on usage, and also explains the thought process behind using colours. They cover picking and mixing colours, controlling greens, understanding warm and cool, using colour for shape composition, values, creating transitions, and much more. There's a sizeable amount of content devoted to glazing, and the differences compared to mixing. There are occasionally exercises. There's quite a bit of text to go through, but it's a really insightful read. The author Jeanne Dobie is clearly very knowledgable about pigments and can explain effortlessly on how and why mixed colours appear as they do, and the underlying pigments that control colour shifts. One of the highlights of the book is about using colour as a design element, such as picking out shapes and using them as composition elements. Overall, it's a great watercolour instructional book that can be read again and again because there are lots of useful information. It will give you the knowledge and all you have to do is go paint and experiment. Recommended to beginners to advanced watercolour artists.